Any info on S L Reed, the man who photographed LHO outside the Texas Theatre ? Unfortunately, there is no reference for the information cited. Comments: Worked at Terrell State Hospital. He took photos of LHO being taken out of Texas Theater from across street. Wife: Betty. 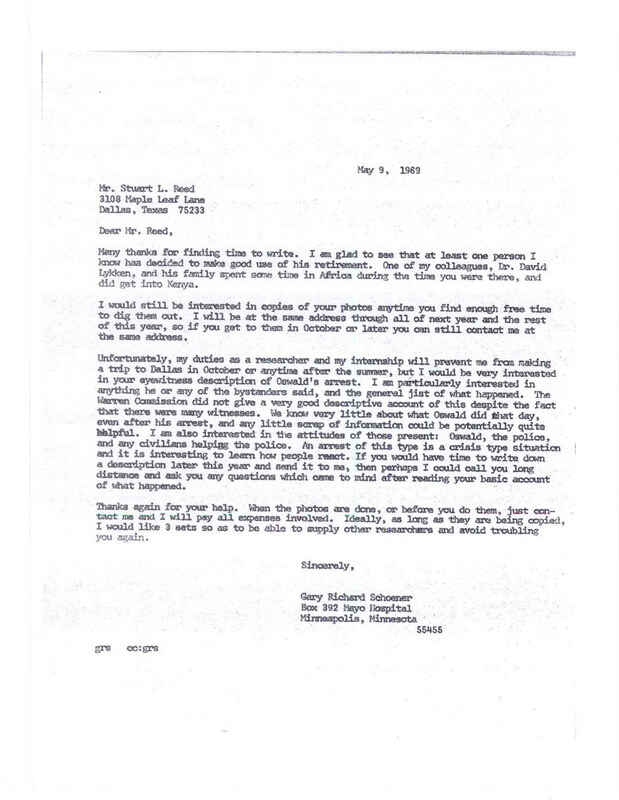 In 1963 and in 1999, Reed is listed at above address. at least to me.....There are several interesting connections between persons in the JFK Saga and Terrell State Hospital. from where James Henry Dolan was known to be on 10 Sept., 1963, E. Windsor, NJ, courthouse. On edit, Stuart Reed, in 1969, related to Gary R. Schoener that he had retired to Panama in 1968 and was using his daughter's address in Dallas where he also was storing some belongings. I got the impression, since it was dated 26 November, 1963 and signed in New Orleans, that Reed himself had not seen the photos he had taken on the 22nd in Dallas yet. He had taken the photos of the bus Oswald was riding on and the others at the Texas Theater, and then he arranged for the film to be developed, left Dallas for New Orleans, authorized the FBI to pick up the developed photos from the Dallas lab, and then left the country. There is no explanation in the six documents as to why Stuart Reed was in such a rush to go to Panama that he could not find time to pick up his own historic photos, and evidence in the assassination of the president, from the photo lab. Stuart Reed was a material witness and a photographer with talent and amazingly good luck of being in the right place at the right time, at least twice. Why was it so important that he be a passenger on 26 November on an "unidentified boat" leaving New Orleans for Panama? Why couldn't his trip be delayed so he could be questioned by the SS, FBI, and DPD and the WC and interpret his photographs and how and why he was positioned where he was to take the photos, twice? as a writer I'm looking for connective tissue between story elements that can make sense. I think various elements can sometimes be laid on a plumb line, helping a linear tale to emerge. If you take a close look at the accompanying photo [sorry for the quality, but I'm barely competent with a scanner], you'll see two red circles. The top one identifies the building in which Powell worked, the Rio Grande Building on Elm St. where the 112th MIG was situated. The bottom circles shows a bus, purportedly driven by Cecil McWatters with one LHO aboard. For those who have always wondered why LHO walked east to catch a westbound bus, it should be noted that LHO reputedly boarded that bus within a block of the 112th MIG offices. This could be written off as entirely coincidental, were it not for the 112th MIG's apparent prior knowledge of LHO/AJH, as stipulated by Col. Robert Jones in his HSCA testimony. Draw whatever inferences you choose. More to the point, however, is that the photo below was one of two reproduced in Robert Groden's "The Search For LHO," both of which depict that same bus making its way along Elm St. toward the TSBD. Both photos were taken by Stuart L. Reed, who also snapped at least one shot of the TSBD and a number of shots of LHO being arrested and escorted outside the Texas Theatre [also contained in "TSFLHO"]. The quality of Reed's photos is remarkably good, suggesting that if he was an amateur photographer, he was quite gifted. More pertinent, however, is that it seems Stuart Reed snapped the TSBD not long after the assassination, as well as Oswald's getaway bus with Oswald on it, and the subsequent arrest. Had Reed been a news photographer in Dallas, one could easily attribute his ubiquitous omnipresence at all the hotspots that day to his connections with local police and members of the press. Yet, it appears Reed had no such source of immediate inside information. In a case already claustrophobic with coincidences, we seem to have yet another synchronicity. A private citizen photographed the building from which the assassin's bullets were purportedly fired, the very bus on which the purported assassin made his getaway [in two photos, as though trailing its progress], and the purported assassin's capture. The odds of this happening randomly are no doubt beyond the norms of statistical probability. Reed's photos [or at least copies of 14 JFK-related slides] seem to have found a repository at the Southeastern Louisiana University, and I think Reed devoted himself to running the family's sod farm in New Jersey in the interim. He would have been in his mid-20's in 1963, as I recall, and I think he may have been serving an active military hitch at the time, but cannot remember anything specific. I believe others here know something more about Stuart Reed, and I'd welcome any additional details about this remarkably lucky photographer. Consider that it is likely that the FBI took custody of Stuart Reed's printed photos from the Dallas developing lab while Reed was on a boat sailing to Panama. We have only the FBI's version of what photos were taken by Reed and developed by the lab. Any exculpatory photos beneficial to the accused, Oswald, could be disappeared without Reed or anyone else noticing. 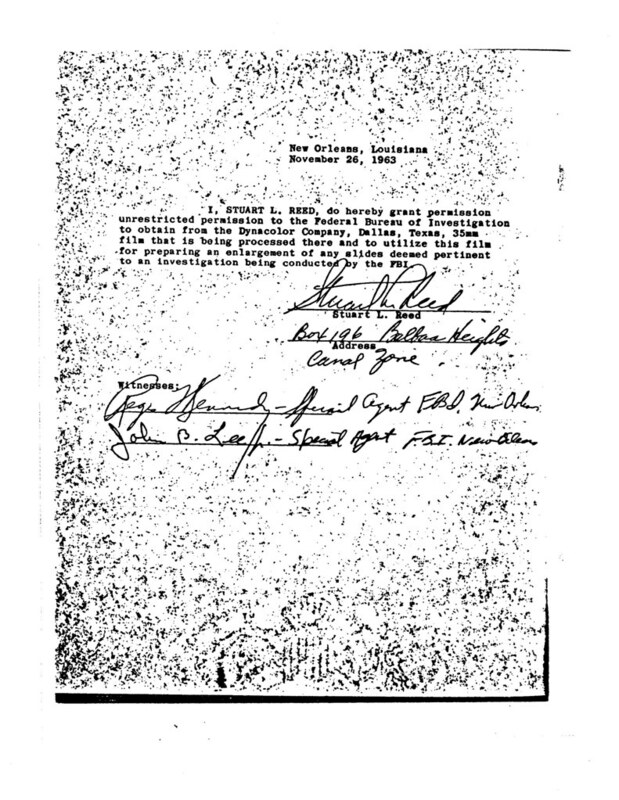 Any photos deemed too coincidental, especially considering that Stuart Reed is presented as the photographer of a timely shot of the sixth floor window, two shots of the bus that Oswald "made his escape" in, and of his arrest at the Texas Theater, could also have been disappeared if their existence was determined to be even more unbelievable than the photos which were attributed by the FBI to Stuart Reed. Was Reed, in November, 1963, a civilian executive of a U.S. Army controlled, "civilian" agency? For the purposes of this Act, including any amendment made by this Act, the Executive Director of the Canal Zone Civilian Personnel Policy Coordinating Board, the Manager, Central Examining Office, and their staffs shall be considered to have been employees of the Panama Canal Company with respect to service in those positions before October 1, 1979, and as employees of the Commission with respect to service in those positions on or after that date. USACARA is a field operating agency of the Office of the Deputy Chief of Staff for ... (3) The Canal Zone Civilian Personnel Policy Coordinating Board, ..
Nice work Tom and thanks. I think Reed is certainly worth looking at. This man just happened to be in very important places with his camera on the day of the assassination. I havent seen the photograph he took of the TSBD sixth floor window, anyone got a copy of it? My scanner is not functioning, so I cannot post it. However, you can find a good clean copy of the photo in Groden's "The Search For LHO" on the bottom of page 101. Thanks Bernice, i am trying to locate all 14 photographs Reed took, yes its been a while hope you are ok ?